Let’s face it: most of your customers and employees are already mobile. Sitting at a desk in the office from 9 A.M. to 5 P.M. every day is becoming an outdated concept. More and more, workers have come to expect the freedom to work where and when they want. It is crucial for your business to be able to accommodate this new mobile work style to stay competitive and attract top talent. 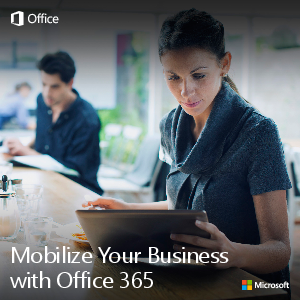 Download this whitepaper to learn how you can mobilize your business with Office 365.